It is appropriate to set out common standard forms, templates and procedures to ensure a uniform mechanism by which Member States' competent authorities effectively exercise their powers in respect of the authorisation of firms for the provision of investment services, investment activities and, where relevant, of ancillary services. 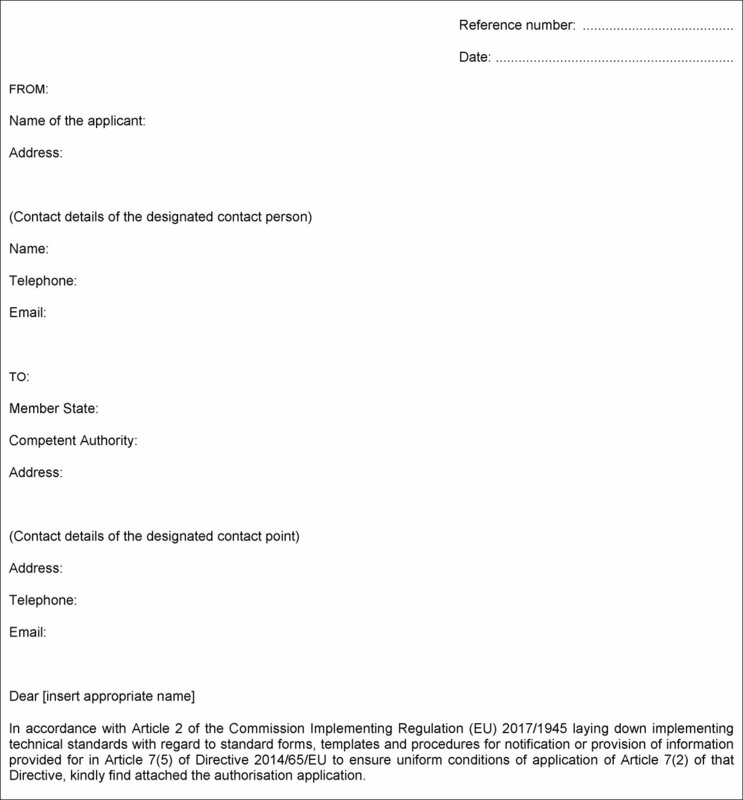 To facilitate communication between an applicant seeking authorisation as an investment firm in accordance with Title II of Directive 2014/65/EU and the competent authority, competent authorities should designate a contact point specifically for the purpose of the application process and should publish the information on the contact point on their website. In order to allow competent authorities to assess whether changes to the management body of the firm may pose a threat to the effective, sound and prudent management of the firm, and to adequately take into consideration the interests of its clients and the integrity of the market, clear time limits should be defined for the submission of information on those changes. 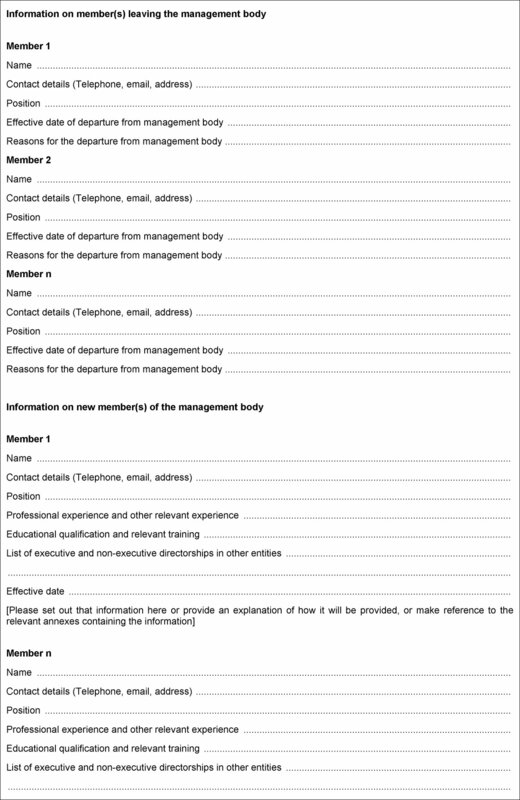 Firms should however be exempted from the requirement to submit information on changes to the management body before that change takes effect where the change is due to factors not within the control of the firm, such as in the case of the death of a management body member. Under those circumstances, firms should be allowed to notify the competent authority within 10 working days after the change. This Regulation is based on the draft implementing technical standards submitted by the European Securities and Markets Authority (ESMA) to the Commission. 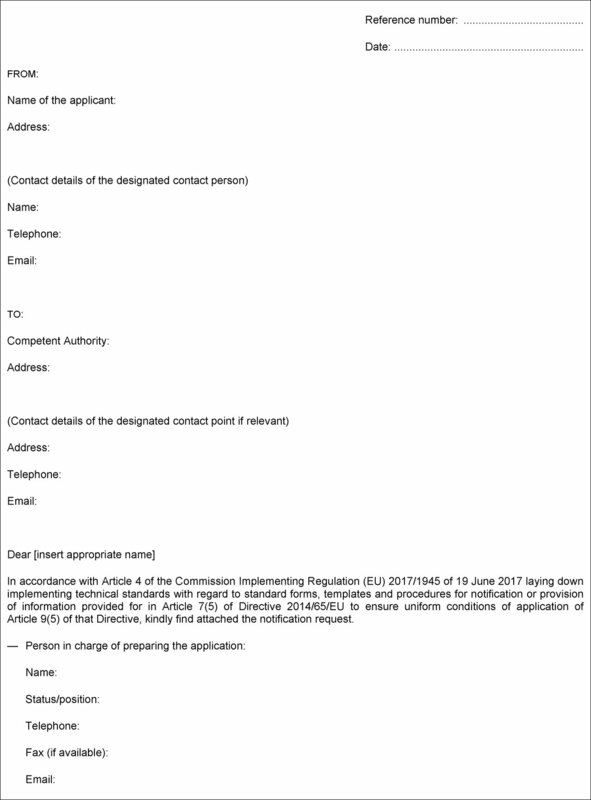 Competent authorities shall designate a contact point for handling all information received from applicants seeking authorisation as an investment firm in accordance to Title II of Directive 2014/65/EU. The contact details on the designated contact point shall be made public and regularly updated on the competent authorities' websites. 1. 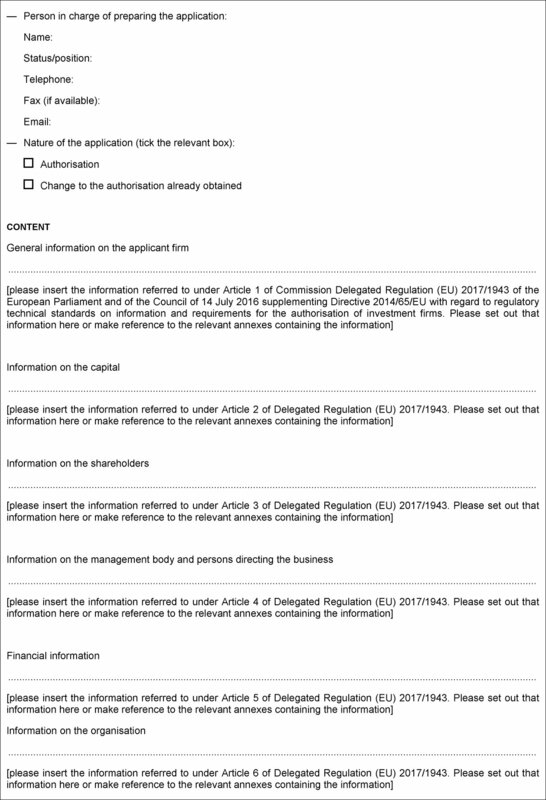 An applicant seeking authorisation as an investment firm in accordance with Title II of Directive 2014/65/EU shall submit to the competent authority its application by filling in the template set out in Annex I. 2. 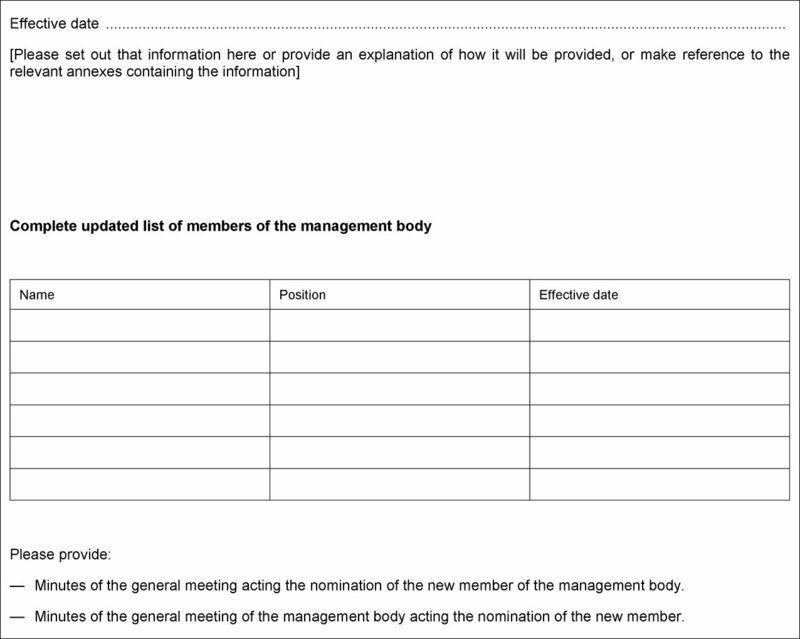 The applicant shall notify the competent authority of the information on all members of its management body by filling in the template set out in Annex II. Within 10 working days from the receipt of the application, the competent authority shall send an acknowledgement of receipt to the applicant, including the contact details of the designated contact point as referred to in Article 1. Where additional information is required to proceed with the assessment of the application, the competent authority shall send a request to the applicant indicating the information to be provided. 1. An investment firm shall notify the competent authority of any change to the membership of its management body before such change takes effect. Where, for substantiated reasons, it is not possible to make the notification before that change takes effect, it shall be made within 10 working days after the change. 2. The investment firm shall provide the information on the change referred to in paragraph 1 in the format set out in Annex III. The competent authority shall inform the applicant of its decision to grant or not the authorisation in paper form, by electronic means or both, within the 6-month period referred to in Article 7(3) of Directive 2014/65/EU. In accordance with Article 2 of the Commission Implementing Regulation (EU) 2017/1945 laying down implementing technical standards with regard to standard forms, templates and procedures for notification or provision of information provided for in Article 7(5) of Directive 2014/65/EU to ensure uniform conditions of application of Article 7(2) of that Directive, kindly find attached the authorisation application. 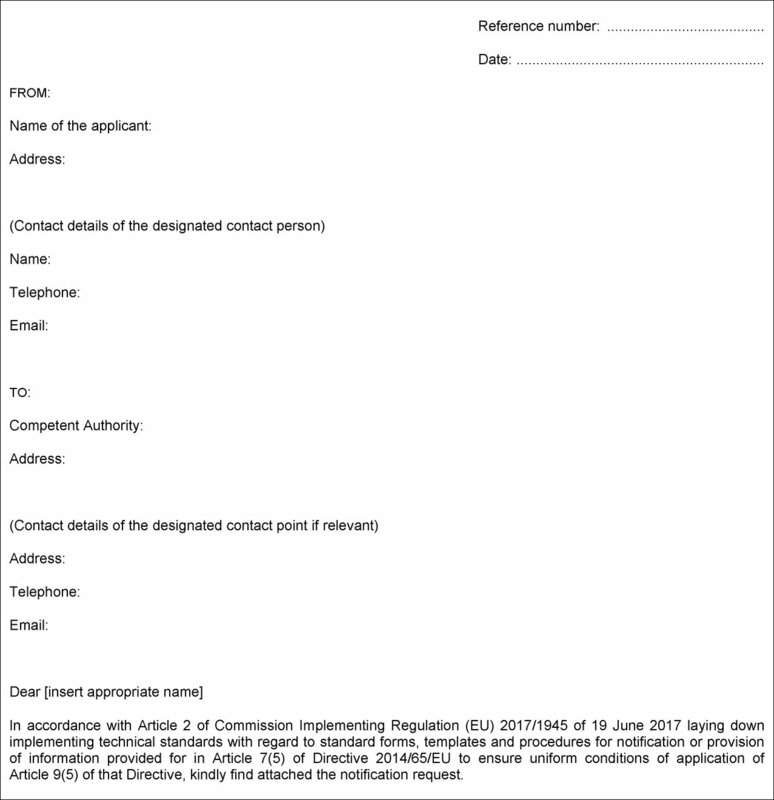 In accordance with Article 2 of Commission Implementing Regulation (EU) 2017/1945 of 19 June 2017 laying down implementing technical standards with regard to standard forms, templates and procedures for notification or provision of information provided for in Article 7(5) of Directive 2014/65/EU to ensure uniform conditions of application of Article 9(5) of that Directive, kindly find attached the notification request. — Minutes of the general meeting of the management body acting the nomination of the new members. In accordance with Article 4 of the Commission Implementing Regulation (EU) 2017/1945 of 19 June 2017 laying down implementing technical standards with regard to standard forms, templates and procedures for notification or provision of information provided for in Article 7(5) of Directive 2014/65/EU to ensure uniform conditions of application of Article 9(5) of that Directive, kindly find attached the notification request. — Minutes of the general meeting acting the nomination of the new member of the management body. — Minutes of the general meeting of the management body acting the nomination of the new member.